Rikki started training and competing in Special Olympics seven years ago through her high school. The teachers encouraged her to join, so she started with track. The next year, she added bowling, then equestrian, then swimming and this year she tried bocce. “We have met the most amazing people and athletes,” said Chris. Steve works for the Will County Sheriff’s Department and has been instrumental in getting this department involved with the Law Enforcement Torch Run (LETR). He has taken part in LETR events with several different departments along with the actual runs leading up to Summer Games. This year, he ran the Final Leg in Normal that culminated at the Opening Ceremony at Summer Games. Steve said he’s hooked and will be sure to take part every year. The whole family has been very involved with many of the fundraising events put on by various LETR departments. They all participate in the Polar Plunge that support the fundraising efforts of the LETR which has raised $4.1 million in 2015. “This year we are very excited to help Will County Sheriff’s Department with their efforts,” Steve said. 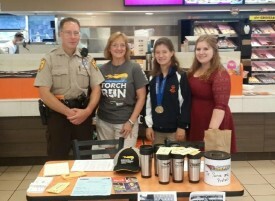 In addition to all they do to support the Law Enforcement Torch Run, you will find Chris and the girls volunteering at Special Olympics Illinois competitions such as State Skating Championships, Summer Games and numerous local events. Needless to say, this family is passionate about Special Olympics and thrilled to be helping further the mission. A few months ago, Special Olympics Illinois asked Steve and Chris to help us reach out to more families and to help create awareness within the law enforcement community. Now the couple serves on the State LETR Committee and State Families Committee. Thank you Chris, Steve, Holli and Rikki for all your enthusiasm and hard work on behalf of Special Olympics Illinois! 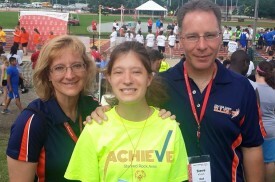 It’s families like this who are really making a difference in Special Olympics!